Warning: link heavy baby stuff post ahead!! So, deciding that I couldn't stand the chunky green-and-purple caterpillar look (or the metal spoons dipped in rubber) I went searching for tableware I'd like (since she could care less). 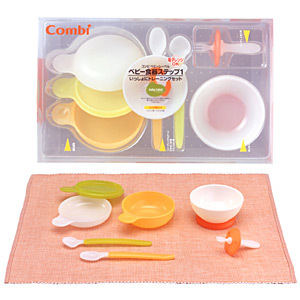 I treated myself to the very reasonably priced infant set from Combi Japan (pictured), and also a couple items by Tigex (who should bring out the rest of their line here!) With a couple of cute pieces from Ikea thrown in, she's all set for now. When she's bigger, more Combi (there's a toddler set as well), more Tigex if I can get it and these cool plates and bowls scouted by my friend Christine at Crate and Barrel. (Okay, they're technically barware, but how perfect for kid's food?) I'm also attracted by this Fishy Dish, and Trebimbi's frost set is on my shopping list for her 1st birthday. Of course, another year or two and it'll be Disney Princess all the way, no doubt. But for now, I'll love her dishes even more than she will. We went through our records again recently to sort and purge and I found a record I'd been looking for! It's called "Best Loved Fairy Tales", produced by Disney in the early 60s (and rereleased with a book around 1970) and featured Rica Moore narrating a group of fairy tales over bass and bongos. And pretty weird...I coudn't find much out about Rica other than she was a singer for Ray Coniff and did several Disney recordings. No sign of it ever being released on CD, and my copy was well-thrashed (it's amazing it survived, actually, my brother and I played the hell out of our small record collection!) so I'm happy to report that I scored a clean copy on ebay just days later, and assuming there's either still a turntable in the house or I manage to digitize the tracks, Emily will get to hear my favorite record too!